As you were leaving for work this morning and said goodbye to the family, you noticed something a little different about your teenage son. No, it is not the fact that he actually smiled, was not wearing black or did more than nod in your direction as an acknowledgement. What you did notice is that he has some noticeable hair on his face, chin and above his lip. You knew they day would come eventually, and you think back to when you were a teen and first realized you had to shave and then thought about the fact that your father did not help you with it all. Well now it is your time to right the ship. Here are some steps you can take to teach your son how to shave. • Get the Equipment – Take a trip to the supermarket or local drug store and get him some of his own supplies. You may even want to take him with you to do this because, frankly, he may not want to use what he considers to be an “old man” razor and shaving cream. Swallow your pride a little and let him have his moment and get a razor and shaving cream. He probably does not need to experience the joy and pain of aftershave just yet. • Lather Up – You should take him through the process once to show him how it is done. Wet your face thoroughly with water (warm is best) to soften your skin. Apply the shaving cream or gel to your face in a layer that is not too thick or thin to allow the shaving to happen smoothly. 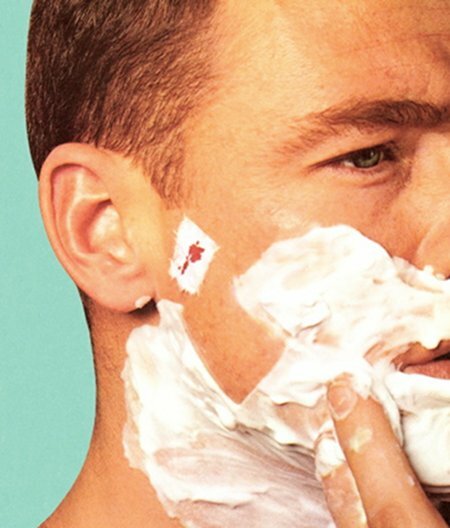 • The Shave – There is a lot of controversy about method here. Some people insist you go with the grain; other say go against it. The truth is the hair on your face grows in varying directions so it really does not matter much. Have him go with the grain to start with because it does help cut back on bumps and rashes. Tell him to take his time, go slowly and do not apply too much pressure. Use short strokes on the chin and jaw. • Cuts – As you well know, cuts are an inevitable rite of passage that occurs during shaving. Tell him not to panic over it and you may want to invest in a styptic pencil to put over any cuts or nicks so the bleeding stops right away. Make sure he rinses his face off when he is done and use some kind of lotion to keep his face moisturized. That is all you need to know. You have walked him through the first of many shaving experiences successfully and you should be proud of yourself. It is a great father-son bonding moment that you have shared and it may be the only time he actually talks to you that day if he is like a lot of other teenagers. Now that he has started shaving, it will not be long before he is asking about his own car. It might be a good time to start looking at www.mcpeeksdodge.com to see what is available. You will find at http://www.mcpeeksdodge.com/ that there is a great selection of new and used cars. Maybe you can convince him to look at some with you when you take him down for that haircut he needs.